We offer many of our books in the EPUB, MOBI, and PDF formats. EPUB is a format compatible with many smartphones and eReader devices. MOBI is the native format for all Kindle eReaders and tablets. PDFs can be opened on any Mac or PC with the free Adobe Reader software (or Adobe Digital Editions if the PDF is protected with Digital Rights Management software) as well as on many smartphones. Most of the eBooks we offer can be viewed on more than one device. If you download the eBook file to your computer, you can then copy it to a portable eReader, Kindle, Nook, Android phone or tablet, iPhone or iPad, or another smartphone. Keep reading for more information on which format is best for you. We offer our eBooks in formats that work on most devices. Look for your device in our compatability list below. Most of our eBooks, except where noted in our Store, are DRM-free, and you can return to your Account page to download them again if you need to replace lost files or want to load your books onto new devices. Find your device and recommended eBook file format below. Click on the links for more device-specific information. Macs and PCs can read files in both EPUB and PDF formats. For more information on purchasing, downloading and reading eBooks from our store on your Mac or PC, see the PC/Mac section of this guide. Most tablets and eReaders (including the iPad and Nook) and smartphones (including the iPhone and Android) can read eBook files in the popular EPUB format. Most can also read eBooks in PDF, although PDF eBooks don't always display well on smaller screens. To the right you'll see links to specific instructions for using our eBooks on the most popular eReaders and smartphones. Kindle eReaders use Amazon's somewhat proprietary MOBI file format. MOBI-formatted books can also be viewed on iPhone, iPad, and BlackBerry devices, as well as personal computers, via the Kindle app. Other eReaders, however, such as the Nook and Sony Reader, cannot read Kindle's MOBI eBooks. Kindles can also read PDF-formatted eBooks. To learn about using MOBI and PDF files on the Kindle, see the Kindle section of this guide. If versatility is important to you, choose the EPUB version of a book when available; it's compatible with almost all devices and will look best on the screen of your specific device. Note that EPUB files will not work on the Kindle unless they are first converted to MOBI. If you have a Kindle, we recommend downloading the MOBI version of our eBooks, when available. If MOBI is not available, choose the PDF version. If you would prefer to download the EPUB and convert it for use on your Kindle, an internet search can provide you with several options, such as using a program called Calibre to do the conversion. The actual conversion process is beyond the scope of these help pages. If page fidelity is important to you, choose the PDF version of a book; it exactly reproduces the original printed page and can be viewed with the popular Adobe Reader software on many devices. If one of our products is available as an eBook, you'll see a link similar to the one below on the product page in our store. Click the Buy button to purchase the eBook. eBook purchase options in our Store. After completing the purchase process, the file is now available on your Account page for downloading to your computer's hard drive. Click the link to download the eBook after purchase. Specific instructions for the purchase, download, and use of eBook files on a number of devices can be found via the links on the right side of this page. Can I Share My eBook Files? When you purchase an eBook, that copy is designed for your own personal use. While you can copy an eBook file for use on another device you own, such as a portable eReader or smartphone, you cannot share copies with other people. You also cannot sell used eBooks; ownership is yours only, and cannot be transferred. 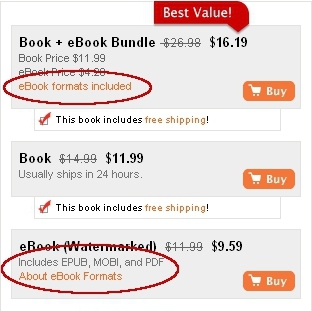 Most of our eBooks are sold without DRM and can easily be copied to up to six devices. You cannot share these eBooks with other people, however. Our non-DRM eBooks are embedded with personalized watermarks that help us identify any unauthorized copies found online. For more information on watermarking, see our Watermarked eBook FAQ. To protect against unauthorized copying, some of the eBooks we sell as PDFs include digital rights management (DRM) technology. This technology limits the use of the purchased eBook(s) to a maximum of six devices. Adobe Digital Editions is required to view these DRM-protected files.